The Love sculpture in Manhattan provides a great NYC photo opportunity. The statue is located at the intersection of 6th Avenue and West 55th Street (map). Pay a visit to this iconic piece of street art if you’re in the neighborhood .It’s located in Midtown Manhattan, about halfway between Rockefeller Center and the southern entrance to Central Park. There’s also a nice fountain across the street that’s in the form of a dandelion seed head. “Love” was created by American artists Robert Indiana. The design was actually created for a Museum of Modern Art Christmas card in 1964. 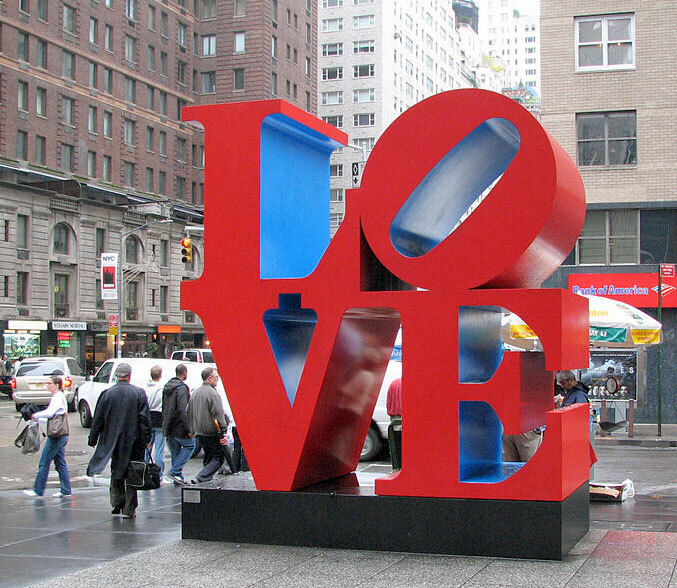 NYC’s “Love” sculpture is one of many that now appear around the world. The first sculpture was created by the artist for display at the Indianapolis Museum of Art in 1970. Since then, versions of the statue have been placed in dozens of locations world-wide. A similar “Hope” statue was installed at the corner of 7th Avenue and 53rd Street in 2014. It’s located just a block off of Broadway, near the Theater District.